Immoral in terms of historical truth, the Russian Foreign Ministry called Warsaw's decision not to allow Russia to work on renovations of the museum at the site of the Sobibor concentration camp. The Poles themselves offered our country to join the project. Zinaida Kurbatova will tell us why they changed their mind. Warsaw's decision not to allow Russia to the project to update the memorial in Sobibor was predictable, it was preceded by long delays. Four years ago, Russia received an official invitation to participate in the creation of a new concept for the museum from Israel, the Netherlands, and Slovakia. The Polish side stalled, putting forward new conditions without informing the Russian side. That is, at the most primitive organizational level. And now the official message from Warsaw that the Project's International Steering Committee has decided at a meeting "to continue cooperation in the former makeup," that is, without Russia. The Russian Ministry of Foreign Affairs accused Poland of demonstrating Russophobia. It's hard to deny that Russia's participation in the creation of the renovated museum, the Sobibor memorial, is absolutely justified. The Nazis created the concentration camp in Poland, near Sobibor station, for the destruction of Jews who were brought here from the occupied territories. Himmler himself watched to ensure that the machine of death worked smoothly. Here, 250,000 Jews from Poland, Holland, France, the Czech Republic and, together with them, Jews from the USSR perished in the gas chambers. 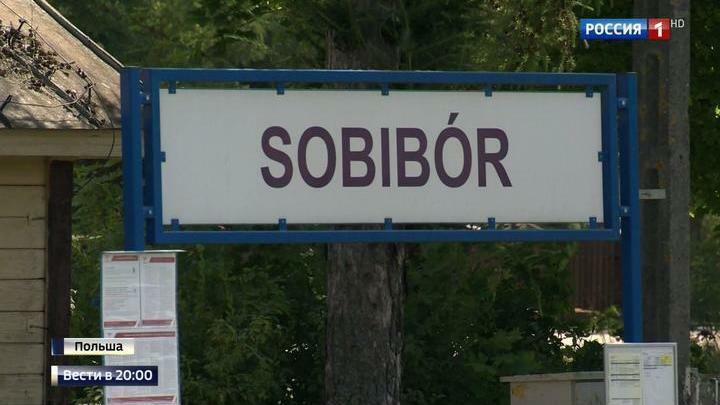 And based of this Russia should take part in renovating of the museum in Sobibor. But there is also an important detail: from here on October 14, 1943, the only successful mass prisoner escape took place. The person who planned and headed the operation was from the Red Army, Alexander Pechersky. Arkady Vayspopirs, now living in Israel, is recalling it. They summoned him to the workshop, and started measuring him. I came up from behind and hit him with an ax. Thanks to the escape organized by Lieutenant Pechersky, 300 prisoners escaped to freedom, they hid in the woods, the SS managed to catch and shoot 150 of them. After the escape the death camp was wiped off the face of the earth. Until now in the Sobibor Museum, there wasn't even a sign telling about the feat of Alexander Aronovich Pechersky. Apparently, such a sign will not appear. Poland is driving itself into a historical dead end. How will they later explain with this, who organized the uprising in Sobibor. Veniamin Kaverin first wrote about the uprising in Sobibor in the journal Znamya in 1945. Serious research, books, films are devoted to this page of history, one is a famous film, where the movie star Rutger Hauer plays Pechersky. Three years ago, the Sobibor site was excavated, which can shed light on some details of the of the prisoners' life and escape. Poland seems to want to privatize this history. How will the new museum tell about the escape from the camp, and will the role of the Red Army prisoners be noted in this unprecedented operation?